Alright, so first off. Where have I been?!? It’s been a while since I’ve updated [don’t fret, I’ve definitely still been baking] but, I’ve actually been really busy this past month. So a quick update on me: I just moved to Westwood with my best friend Sheva. We’re in the process of unpacking but were really excited because our apartment is very very very cute! And I just got back from a trip to Berkeley. But, now I’m back and ready to update. I’ve also got a few tricks up my sleeve for Thanksgiving so stay tuned! Mmmm Mmmm mmmmm. 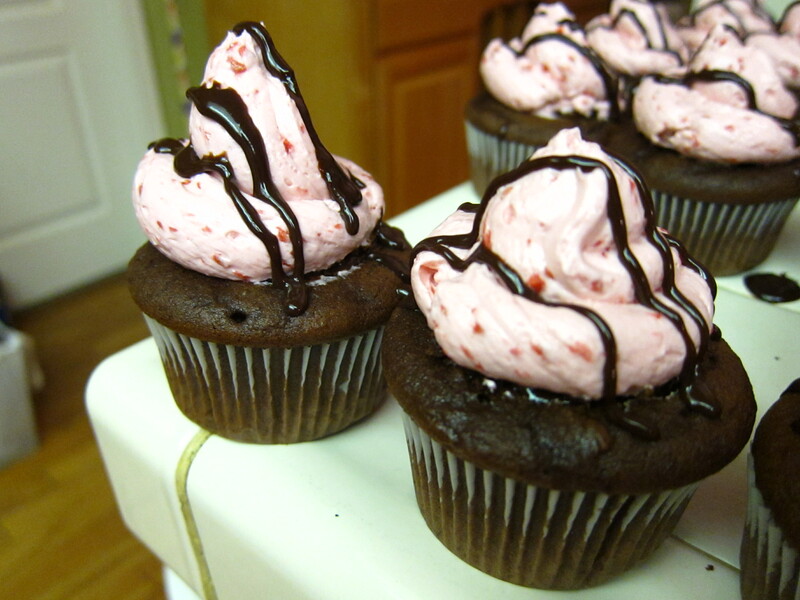 I really love the taste of dark chocolate and raspberry together. 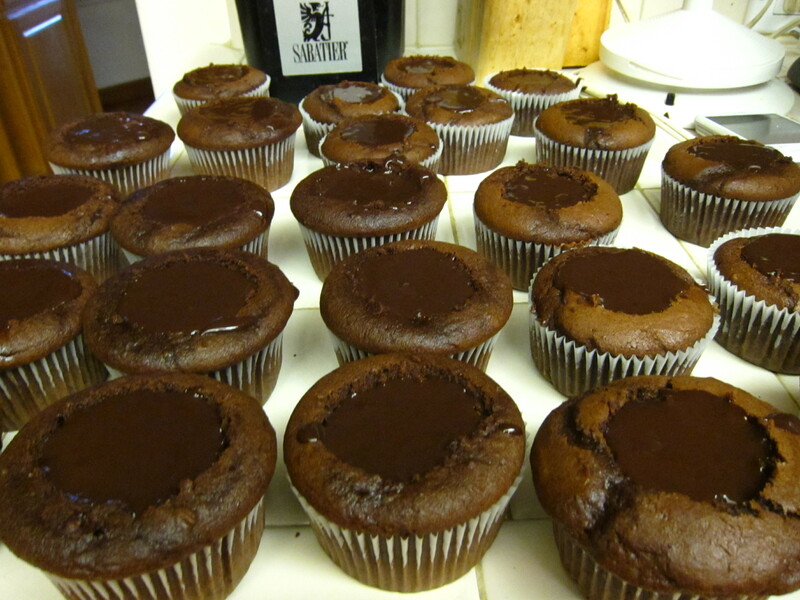 I took one of my favorite chocolate cupcake recipes from my Martha Stewart book and then filled it with delicious dark chocolate ganache. So, as always, I pre-heated to 350, separated my dry ingredients with my wet. With this recipe you beat the wet ingredients into the mixed dry ingredients until the batter is smooth and yummy. Bake for 20 minutes and voila! 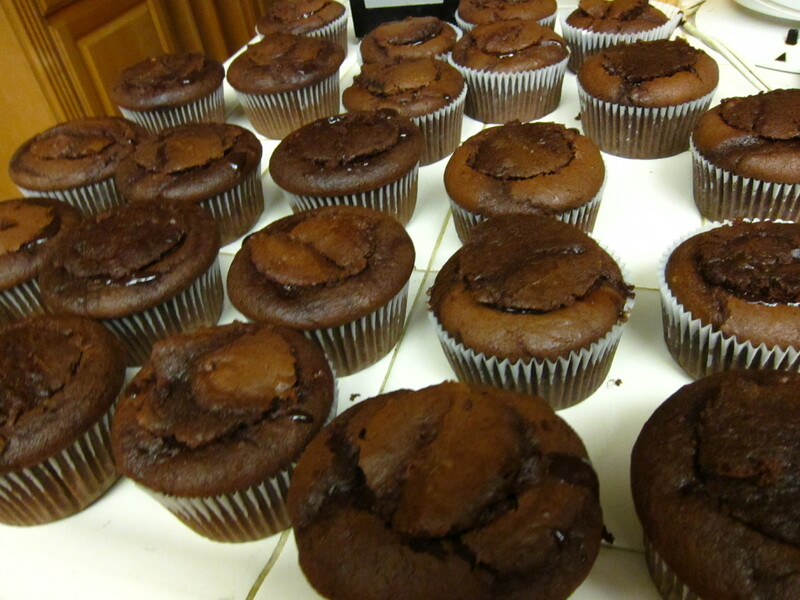 These cupcakes, especially, give off a beautiful chocolate aroma as they come out of the oven. While I let them cool, I made my ganache. Ganache is really delicious and really, really easy to make. The ganache recipe I used makes 2 cups ganache. 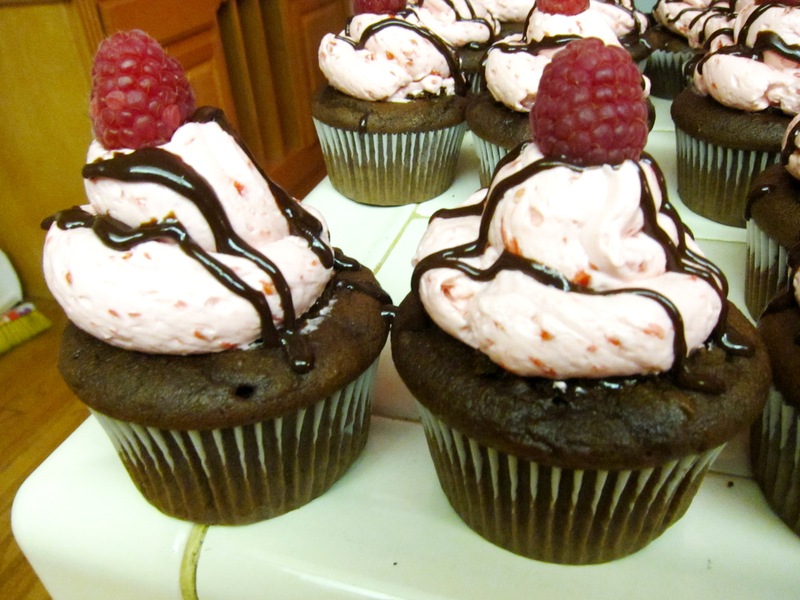 Now, I like to really fill my cupcakes so I added an extra half to my entire recipe to get 3 cups out of it and that seemed perfect for me. You take your very high quality chocolate [it’s not about being uppity, the better the chocolate, the better the consistency. 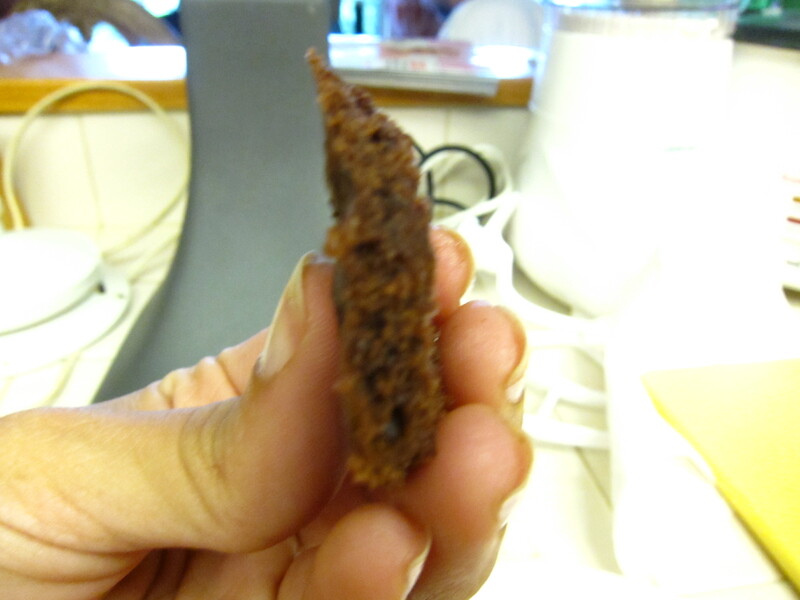 Chocolate is tempered and higher grade chocolate will not lose it’s consistency. I used 12 oz] and place it in a heat proof bowl. Then bring your heavy cream and corn syrup to a strong simmer. Then pour the cream mixture on top of the chocolate. 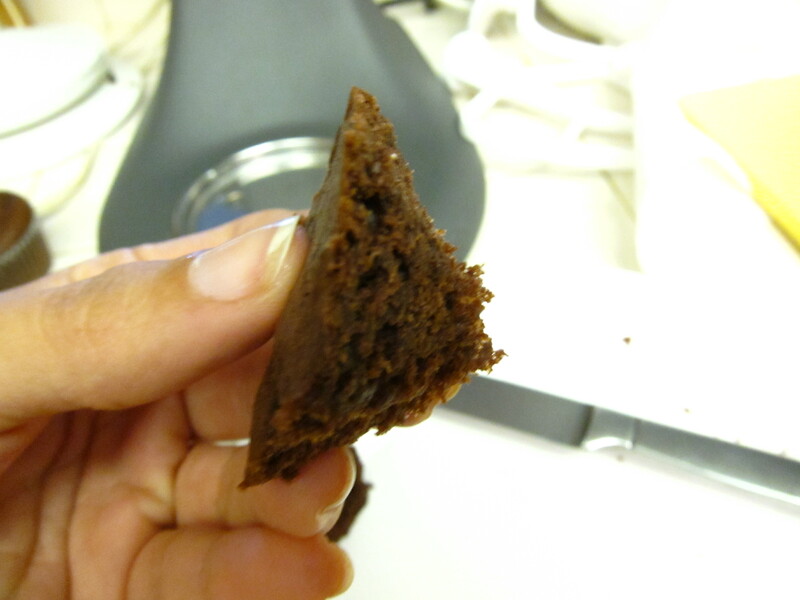 Let it stand for 1 minute [so the chocolate can begin to melt] and then mix it till it becomes glossy and smooth. I like to use a folding motion when I mix my chocolate and cream. If it’s not mixing as perfectly as you’d like, place it over a double broiler and mix as it reheats. Just be patient with it. Once it’s beautiful smooth and glossy, let it cool and thicken [if you’d like to quicken the process, place it in the fridge and mix it every 5-10 minutes till it is the desired consistency]. Then I cut off the tips to leave nice disk-like lids to the holes I have created. Then, when you ganache is ready, fill them! 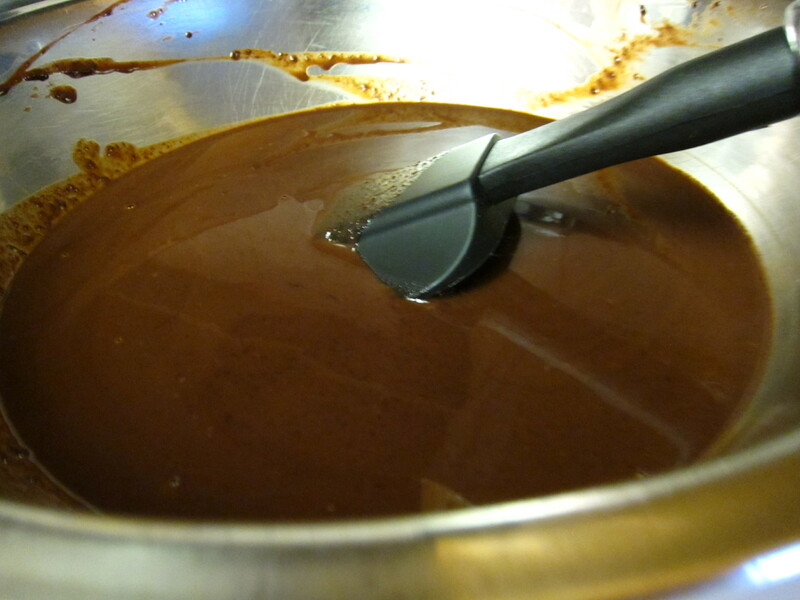 Mmmmm Yummy ganache….mmmmmm. Now Top them! I like to top them because it’s easier for the buttercream to stick to the cake rather than the gooey ganache inside. Speaking of buttercream, let’s get to it! 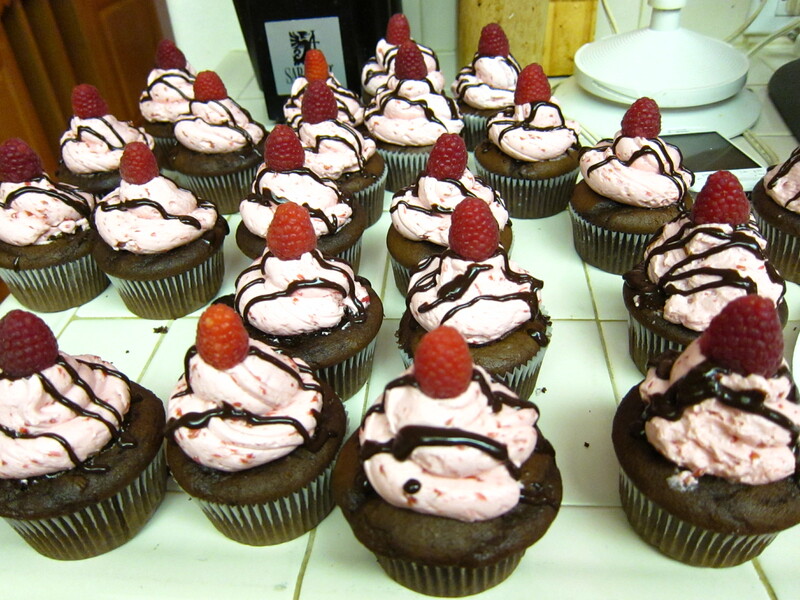 I took these to my Mom’s friend’s birthday party and they were a hit! I hope you enjoy! Spoon the batter into liners about two-thirds full. Bake approximately 20 minutes, or until tester comes out clean. 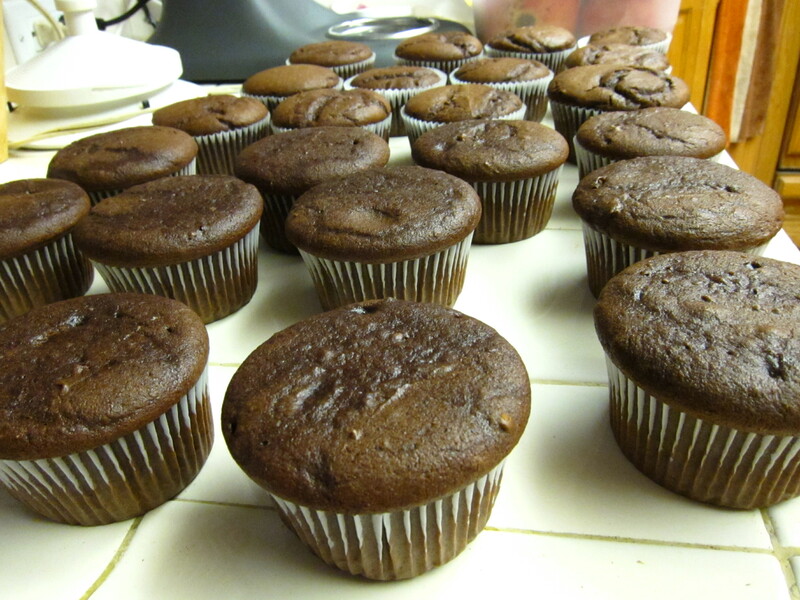 Transfer tins to wire racks and allow to cool for 10 minutes; turn cupcakes onto racks and let cool completely. 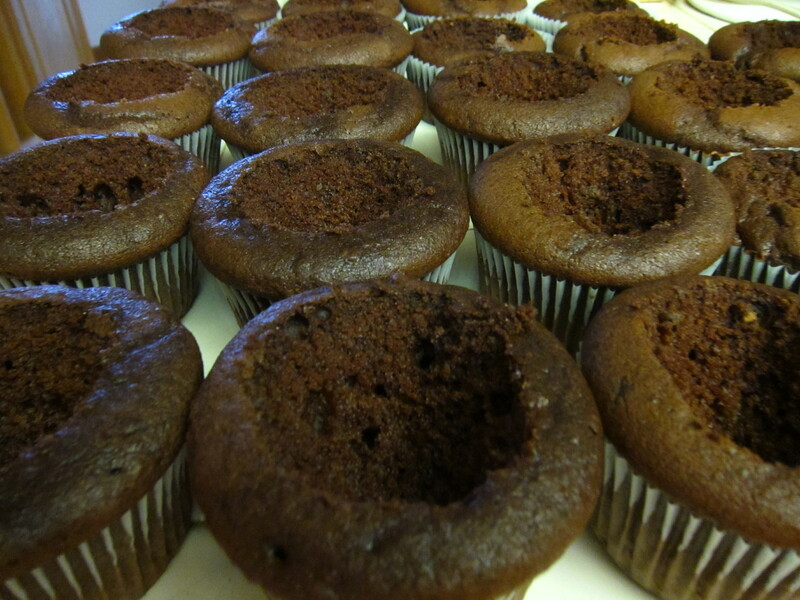 Cupcakes can be stored overnight at room temperature, or frozen up to 1 month in air tight containers. Place chocolate in a medium heatproof bowl. Bring cream and corn syrup to a simmer in a small saucepan over medium heat. Pour over chocolate; let stand for 1 minute. Stir until shiny and smooth. Let cool slightly. 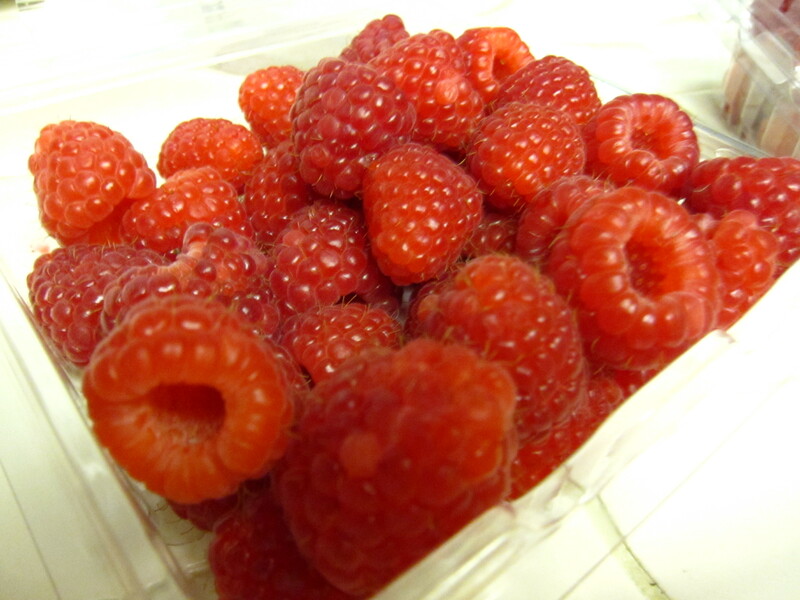 Puree raspberries in a food processor and set aside. Combine egg whites and sugar in a heatproof bowl set over a pan of simmering water. Whisk constantly by hand until the mixture is warm to the touch and sugar is dissolved (the mixture should feel smooth when rubbed between your fingers). Pour egg whites with sugar into a stand mixer fitted with whisk. Mix on medium-high speed until stiff peaks form about 10 minutes and the bowl is cool. Switch to medium-low speed and add butter a few tablespoons at a time. Mix well after each addition. After all the butter has been added scrape down the bowl and switch to paddle attachment. Continue beating on low speed until buttercream becomes smooth. Don’t worry if the buttercream starts to look curdled. Just keep beating until it comes together. 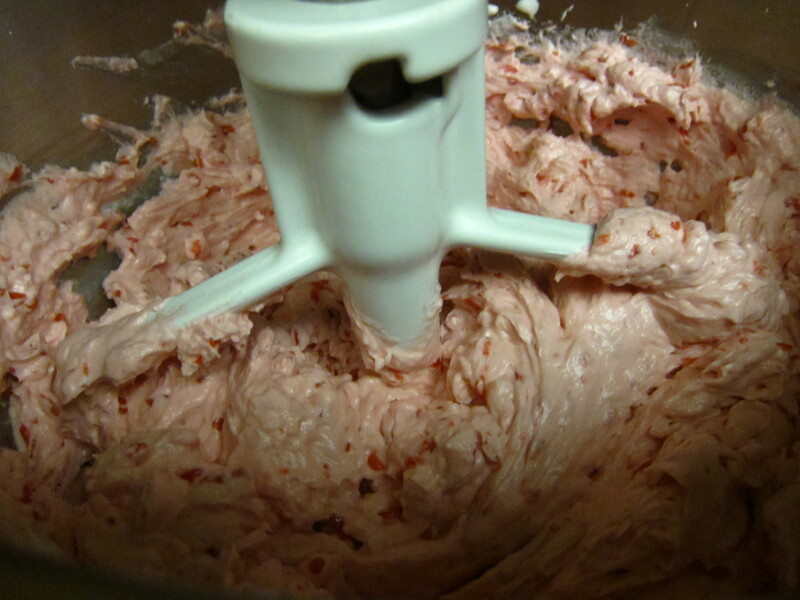 Then add raspberry puree and beat until combined. Oh no! 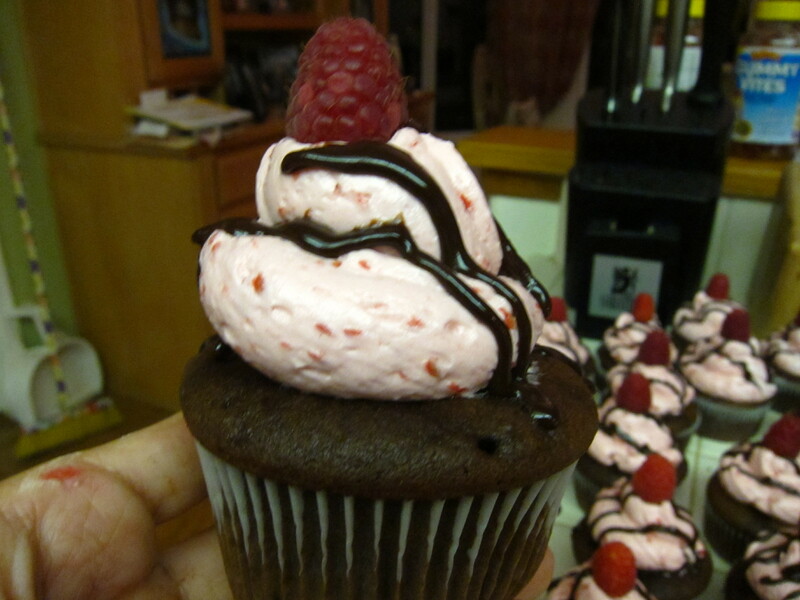 Okay, my advice: try to incorporate some of the raspberry compote before you paddle the buttercream and slowly add as it incorporates. I would say adding a little less compote would help too. 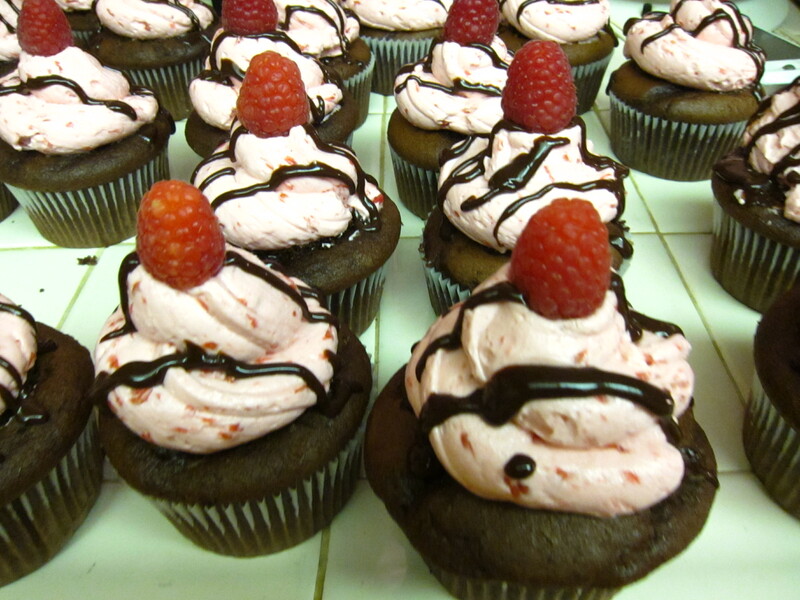 It is difficult mixing the oily characteristic of the buttercream with the acidic characteristic of the raspberry. Also! 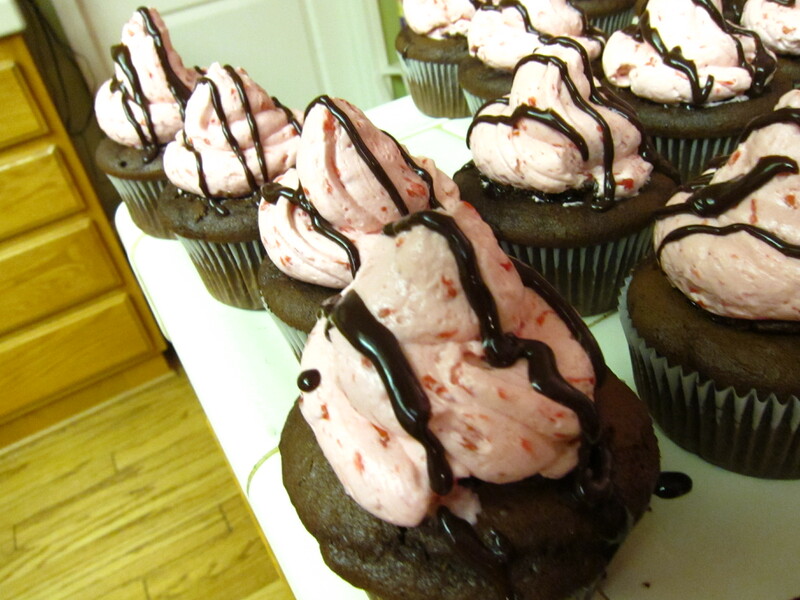 If your kitchen is too warm it could mess with the chemistry of the buttercream. I hope that helps! Thanks for reading!